There is a recurring trend in modern drug discovery that involves looking at natural products (NPs) as a source of inspiration in the design of screening libraries. However, difficulties with follow-up optimization chemistry may occur after the initial screen as NPs tend to be rather complex. An important issue is the IP position of the scaffold. Unfortunately, the need to achieve composition-of-matter patent status can be misguided as it can lead research groups away from the biologically active chemical space. Therefore, when studying NPs as a source of inspiration and diversity, it is wise to only consider NPs that have proven to be target specific. In the past, compound collections were designed according to drug-like criteria that addressed oral bioavailability issues rather than binding capabilities. But does this rule help medicinal chemists develop a molecule with predesigned activity and amenability for follow-up optimization? Current trends have dictated that the criteria for high-quality compound libraries has switched from drug-like to lead-like. This means that medicinal chemists favor compounds enriched with pharmacophore elements but with stricter physical chemical properties (preferably measured rather than calculated). Most of all, medicinal chemists like chemically flexible scaffolds that allow the exploration of different synthetic directions during the hit-to-lead phase. To further explore these trends in compound library design, scientists at Asinex performed a comparative analysis of NPs with annotated biological target activity, known drugs, and publicly accessible compound collections. Significant discrepancies emerged during the comparison of the molecular structures of these three datasets. It was found that saturated ring systems such as fused, spiro, and bridged molecules—which are intrinsically rigid and not flat—together with oxygen-enriched molecules are common features of NPs and conversely are poorly represented in commercial compound libraries. In order to translate the results of statistical analysis into practical chemical ideas, we selected frameworks that are frequently found in NPs but are underrepresented among publicly available screening collections, limiting the number of rings to three. This limitation is advisable since more complex systems would direct us away from lead-likeness. 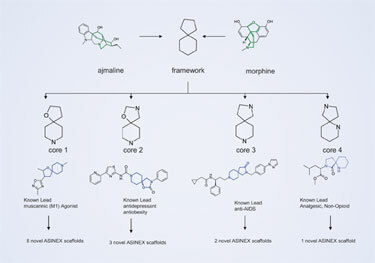 These frames have been populated with O and N atoms in a judicial way in order to obtain a core with desirable pharmacophore elements, novelty, and feasibility (Figure 1). Figure 1. A recent study translated the results of statistical analyses into practical chemical ideas using simple systems with just two to three rings. The next step requires chemists to look for appropriate synthetic methods, which may lead to scaffolds that contain privileged cores. We focused mainly on carbon-carbon bond formation methods, as this has proven to be an efficient strategy for generating unprecedented ring systems and their combinations. Usually it is possible to generate several distinct scaffolds from a single core—typically the core-scaffold ratio is 1:4. We implemented a strategy that allows for the translation of NP complexity into synthetically feasible and patentable scaffolds amenable for med-chem optimization. It is highly desirable to address novelty at an early stage of the design. Therefore, the selection of frameworks is influenced by the IP potential of the frame. For example, if we look to ajmaline and morphine it is possible to identify several rings and ring systems, but the spiro[4.5]system is the most fruitful for generating novel cores and scaffolds (Figure 2). Figure 2. It is imperative to address novelty at an early stage of design, as the selection of frameworks is influenced by the IP potential of the frame. The novelty increases as one moves from framework to final compound, the pharmacophore potential also increases as elaboration and decoration is carried out with med-chem know-how (Figure 3). The optimization of the synthetic protocols and scale-up of the key intermediates is the most time-consuming step of the whole process, but this enables rapid and efficient generation of final molecules during the decoration step. Compound properties (purity, solubility, chemical stability) are also important points that should be considered at the beginning of the screening campaign. We carried out double quality control (NMR and LC/MS), and we physically measured the DMSO and aqueous solubility as well as the chemical stability of each compound. 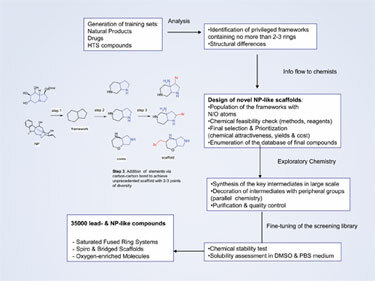 From a total of 35,000 synthesized molecules, 95% conformed to standard solubility criteria, moreover we were able to extract 8,000 highly soluble compounds with a DMSO solubility >1 mM and PBS solubility >100 µM. We believe these highly soluble compounds are ideal for screening at high concentrations against challenging targets that do not indicate activity at the standard HTS concentration (10 µM). This approach has led to the creation of molecules that effectively mimic pharmacologically valuable NPs as they are occupying the same patch of biologically relevant 3-D chemical space. The successful realization of this project is a result of extensive investigative studies and implementation of stereoselective synthetic methods. The output of the project over a one-year period has been 30,000 novel compounds based on 400 unprecedented scaffolds. Figure 3. Novelty and pharmacophore potential both increase as one moves from framework to final compound. are executive officers at Asinex. Web: www.asinex.com.